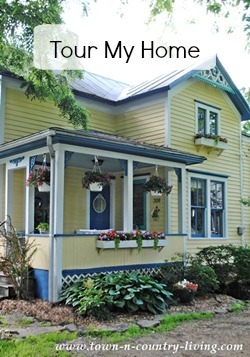 This gorgeous backyard isn’t far from my home and has appeared in gardening magazines. I’m sure you can see why! The pathway leads you throughout the backyard and you begin to wonder if the beauty is never-ending! The water garden with its lilies and fish is of course, the main feature. 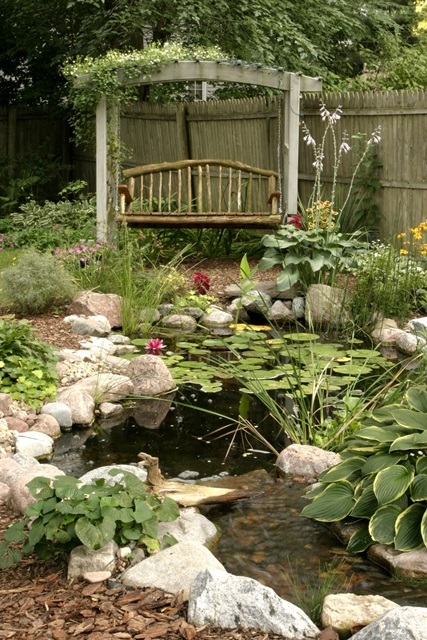 You don’t need a lot of yard space to create a stunning water garden. 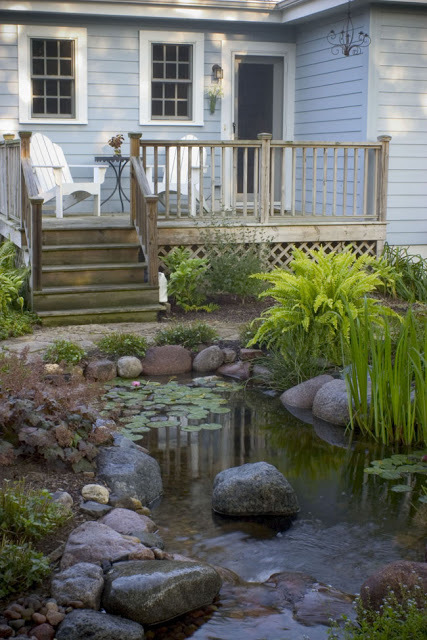 Here, a small deck provides a cozy outdoor living space next to this small pond. 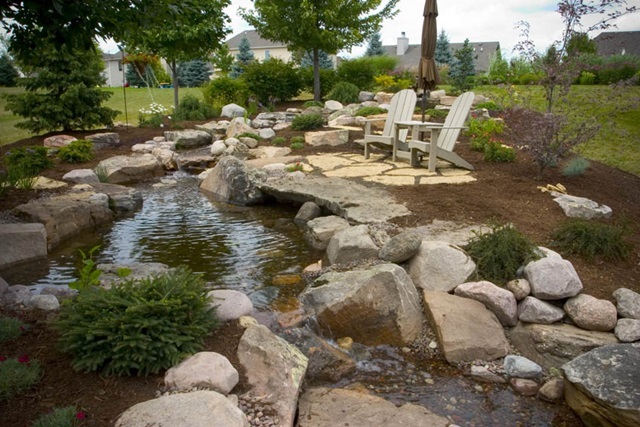 Contrary to popular belief, backyard water gardens are not mosquito havens, provided you keep the water moving with a fountain or waterfall. 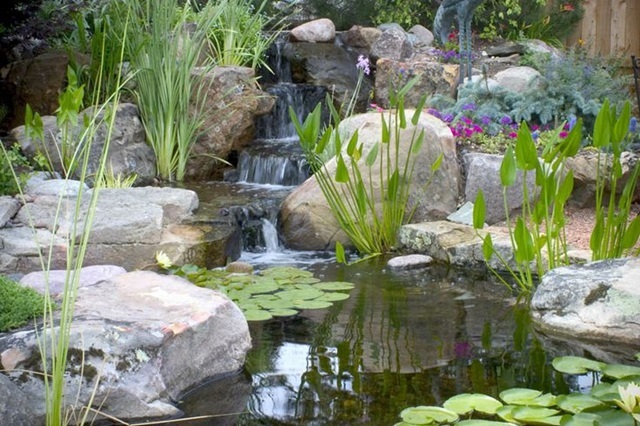 I love the use of aquatic plants in this pond and waterfall. So many plant varieties! 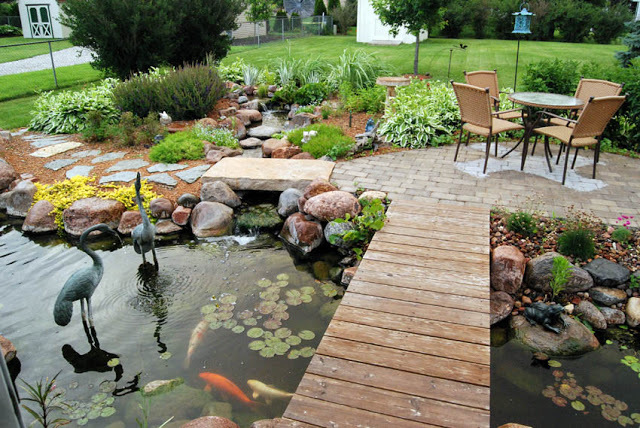 Kids love exploring backyard ponds and are fascinated by the colorful koi and other fish. I love this pond that has a boardwalk crossing over. What a great place to dangle your feet! You can spend countless hours in a backyard paradise like this. This is one of my favorite waterfall photos of all time. I love the clematis winding its way along the mossy rock. This picturesque setting is so idyllic! 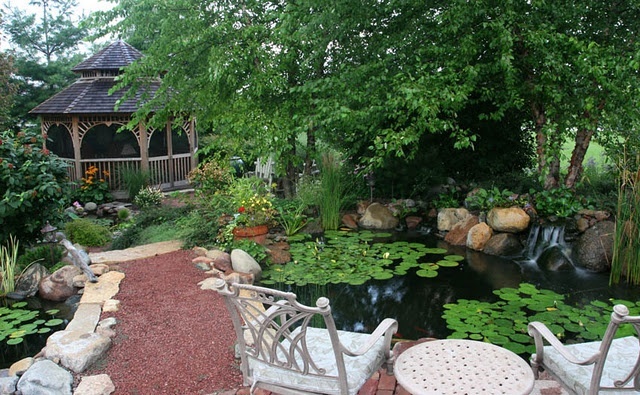 This pond and rustic swing belongs to a local yoga instructor. She loves to come out here and do yoga next to her babbling brook. I love that I work for a company that creates such gorgeous outdoor living spaces. The water draws all kinds of nature to it … frogs, birds, butterflies, salamanders and more. This is a Pondless Waterfall which is basically a waterfall without the pond. I love the dainty water lettuce. In my yard, I have a container water garden and I’m anxiously waiting for the lotus to bloom in it! See those big leaves on the left side of the pond? That’s a lotus! 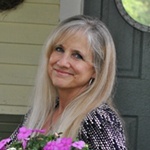 They have gorgeous flowers … I’ll share photos of them soon. 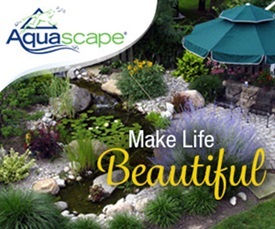 I’d love to know if any of you have a water feature in your landscape! If you do, you know how relaxing and enjoyable they can be! Just a little tranquility fountain in my shade garden. But it’s enough to soothe the soul on a hot summer day. I just love backyard ponds. We had a very small one once and now my son wants to build a big one. 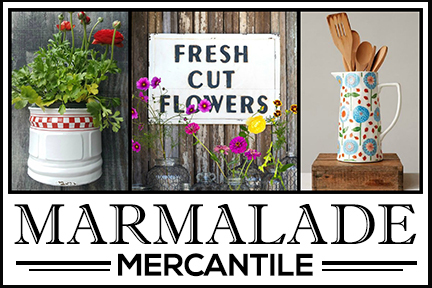 I can only imagine how much fun it must be to work with such beautiful products and projects all day. I work for a steel company so there isn’t much beauty in it. 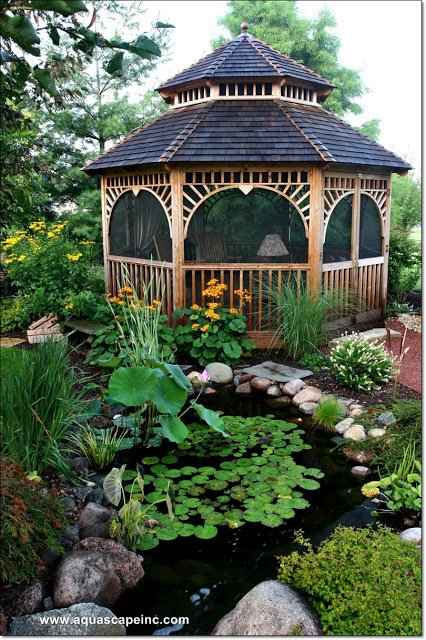 Thanks for sharing and for the inspiration for our next pond project. will be even more beautiful after it is planted with native plants. Thanks for the inspiration! You have some beautiful examples there! We’re hoping to add a water feature to our garden this year. Not sure if it will be ornamental or somewhere for ducks to paddle but looking forward to it more than ever having seen this post and we have lots of stone here to add character to it to. I always thought water would draw mosquitos. Thank you for clearing that up. We installed a Koi pond in our backyard when I graduated from nursing school 22 years ago. i still like it and still have some of the original koi. I lost many during the hurricans of 2004 when we had no electricity for 6 days and they suffocated. It was awful. Not one was less than 18″ long. No. I don’t have a water feature,but I wish I did! maybe I’d be more dedicated to yoga if I had one! 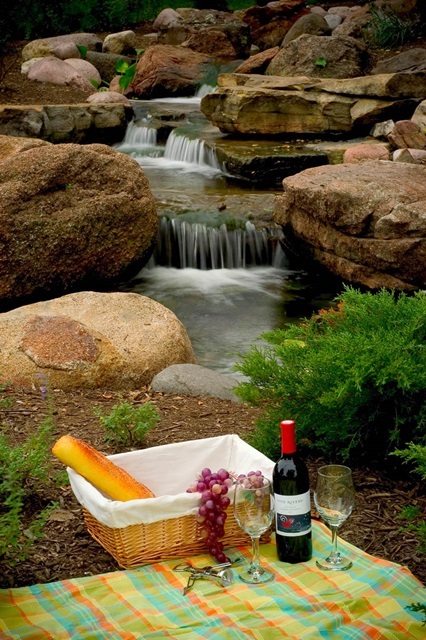 Talk about close to heaven, your photos make me wish we had a water feature. Very restful looking at photos. Thanks for sharing them all, Happy summer days. We do have a water feature on the patio. A little double pond with rocks and a small waterfall. I would rather have a pondless waterfall now that grand kids have arrived, but we had never heard of that years ago. When the water goes between the ponds it sounds like a little babbling brook. 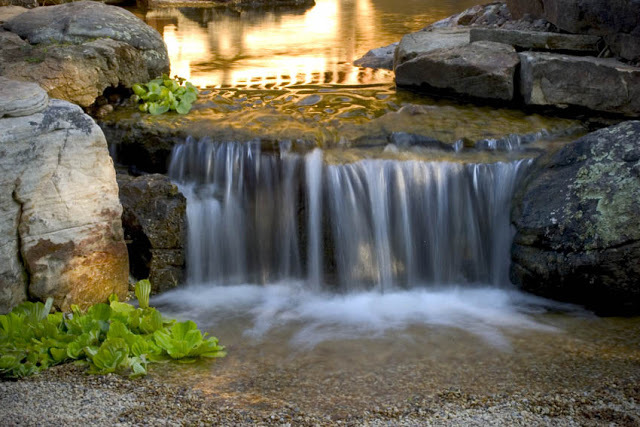 We are very lucky to have a beautiful waterfall and Koi pond. It was here when we bought the house in 2005.
spawn. We set up a separate tank (nursery) Yes! We really enjoy our pond. 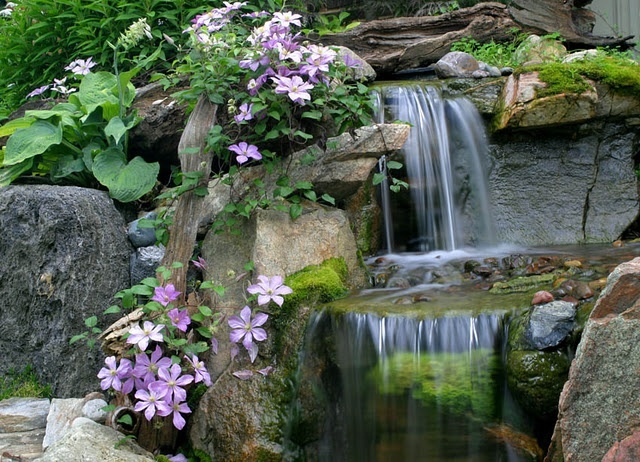 ok, I am going to need a bigger backyard because I want each water feature….especially the one with the clematis sprinkling around it!